"I forgot my sql server password, and i need to get the sql sa password back, how can i retrieve my sql sa password? its SQL server 2005. Any advice is ok, I don't want to reinstall the SQL server, Thanks in advance." There are many more similar situations that people forgot the SA password shortly after installing the MS SQL Server. This article shows you 3 methods to help you change forgotten SA password for your SQL Server 2000/2005/2008/2012/2014 database installation. If you've forgotten the sa password for your SQL server, you are probably in a panic. Fear not, for you can change the password and once again have access to the powers of the SA account using Windows Authentication mode. Login into SQL Server using Windows Authentication. 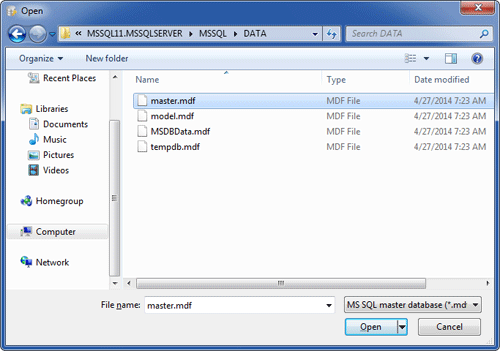 In Object Explorer, open Security folder, open Logins folder. Right click on SA account and go to Properties. Change SA password, and confirm it. Click OK.
where NewPassword is the password you wish to use for the sa account. 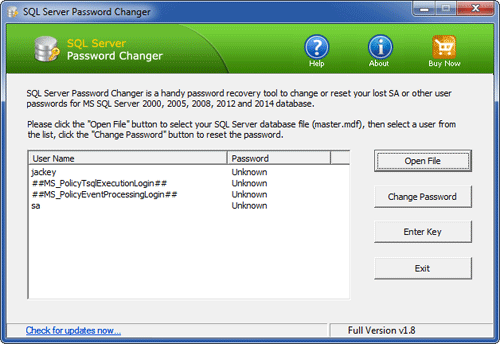 Download SQL Server Password Changer on your local PC, install and launch it.